It’s probably the most common question I get asked in the Map Room. 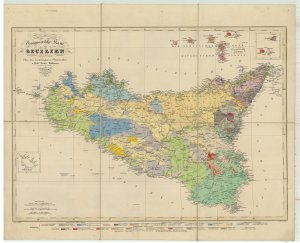 Currently our collection is almost 100% hardcopy mapping, collected by Fellows and librarians throughout the 200 years of the Society’s existence. We hold all sorts of maps including one printed on silk and relief maps made from plaster-of-Paris. Most of them are on paper and in varying conditions ranging from pristine, through slightly foxed, to ripped-in-half-and-covered-in-a-century’s-worth-of-Piccadilly-smog-and-diesel-fumes. They also come in various sizes, but nearly all of them are ‘large’ or ‘extremely large’. One of the Society’s aims is to preserve the map collection by digitising it. This means scanning or photographing more than 40,000 sheets, and to do that we need specialist tools. Tools that we do not have. We have been sending some of older and rarer maps to an outside supplier for scanning – but this is expensive and can only be done in small batches. Step forward Peter Wigley of Lynx Information Systems. He happened to have a large format, continuous feed scanner to spare and knew of our need. 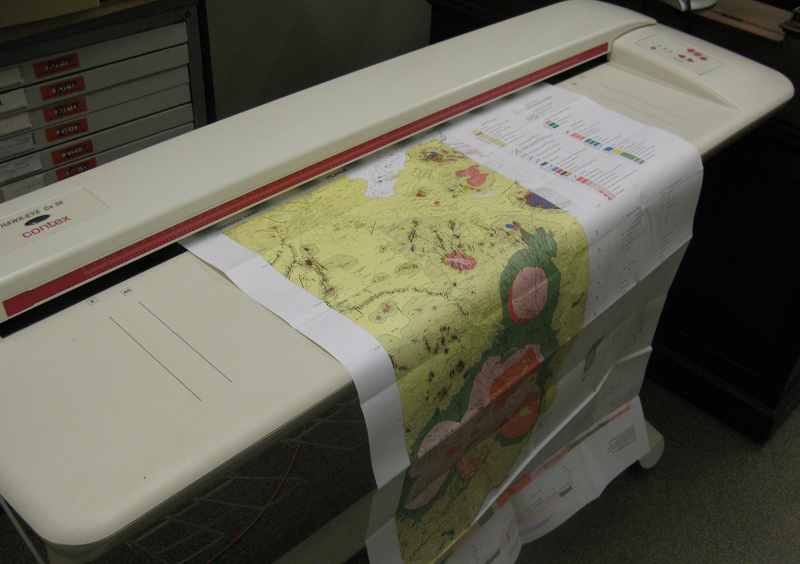 Kindly he donated that scanner to the Society and after finding space for it in a small room in the basement, we can now digitise maps up to 94cm across (as long as they aren’t too crumbly or bound into a book). Our thanks go to Peter for his kind gift. There is however, a much bigger hurdle to creating a digital archive of our maps: The Law. Currently no library can scan any map that’s protected by copyright even to preserve it in an archive. That means nothing published after 1940 can be scanned at all and even some of those maps published before that date aren’t legally scannable either. The recently published Hargreaves Report seeks to change this and hopefully the sections recommending that libraries be able to scan maps and other images for archival purposes will be implemented soon. We would like to be able act sooner that it takes politicians to pass an Act and hopefully I will have more news on that front soon. In the meantime, if you’d like to buy a print of one of the historical and very much out-of-copyright maps we have scanned, head to our website where you can browse the prints currently available for sale. Once I get to grips with the nitty-gritty of how to make the most of our new toy, I hope to bring you a blog showing you the step-by-step the processes involved in digitising maps. Tags: copyright, digitisation, donations, law, map prints, map room, map scanning, maps, preservation. Bookmark the permalink. Previous post ← Earth Science Week day 5: chocolate rocks and angel cake layers…. That is excellent news – and a really generous gift. No maps at all for Africa? [SELF Checks the GIS] GIS is down. @Aidan Karley – we do have maps for Africa. Quite a lot of them, in fact they’re likely to be the priority for scanning when the various technical and legal hurdles have been overcome. Unfortunately the GIS isn’t working right now and I don’t have a time/date when it will be 😦 In the meantime there is a trick you can do with the library catalogue to allow you to search the map catalogue. Step 4 – click on the back button in your brower. This takes you back to the library catalogue with ‘Maps’ now selected. You can then use the library catalogue to search only the map collection. My name is Ben Chasteen and I’m the Science/Technology editor at Before It’s News http://www.beforeitsnews.com. Our site is a People Powered news platform with over 4,000,000 visits a month and growing fast. We like to think of our selves as the “You Tube” of news. We would be honored if we could republish your blog RSS feed in our Science/Technology category. Our readers need to read what your Geological Society of London blog has to say.